A solar cooker is a device to capture the sun’s rays and use the energy to cook food or boil water. Solar cookers come in a variety of designs, from those using expensive parabolic mirrors to those made from recycled materials found around the house. They fall into three broad categories: box cookers, panel cookers, and high-temperature reflector cookers. A box cooker is a well-insulated box-within-a-box with a glazed top and a hinged lid that reflects the rays of the sun into the box. When the lid is propped open and the box is turned to face the sun, food in dark, covered pots in the oven reaches cooking temperatures. 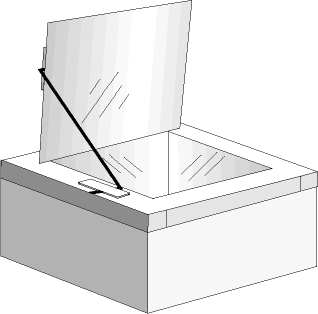 Box cookers can be made of metal, wood, plastic, or cardboard. 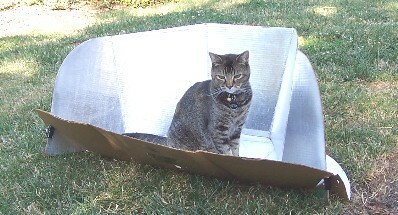 A simple cardboard box cooker can reach temperatures of 200°F to 300°F and generally cooks food at around 250°F. Wood, metal, and plastic cookers typically reach higher temperatures. This is the type of cooker in most widespread use around the world. A panel cooker is a reflective panel that directs sunshine onto a dark-colored cooking pot enclosed in a clear insulating shell such as a plastic high-temperature cooking bag or an inverted bowl. The shell lets in sunlight and traps the heat. Food in the dark-colored pot typically cooks at temperatures between 200°F and 275°F. The panel can be made of cardboard covered with foil or of some other reflective material, such as metal or the lightweight foam used in auto windshield shades. The first panel cooker was introduced in 1994, and this design has been catching on rapidly. It’s lightweight, folds flat for storage, and is the simplest and most economical cooker yet invented. 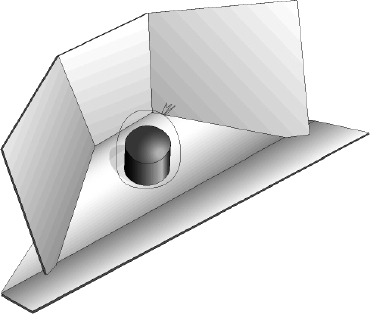 High-temperature reflector cookers typically use a parabolic mirror to focus sunlight on a cooking vessel. The focal point of the parabola can become very hot indeed—typically reaching temperatures of 600°F and above—in a very short time, making cooking with one of these similar to cooking on a conventional stovetop. Besides a parabola, other mirror geometries can be used to create the focal point: segmented near-parabolas, Fresnel mirrors, and the “three-circle” geometry popular in China. All use the same principle. Because high-temperature cookers are usually expensive to build or buy and can be dangerous, Cooking with Sunshine only provides instructions and recipes for box and panel cookers. Solar cookers have uses other than cooking food. For example, they can be used to pasteurize water or milk.